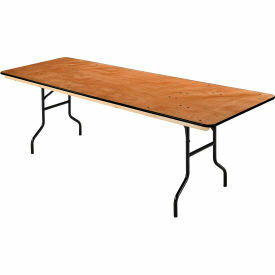 Heavy duty solid plywood core table top construction is completely sealed with UV protective coating to enhance durability. 3/4" thick top with reinforced vinyl T-molding protect table edges & corners. Two solid wood reinforcement bars are mounted to prevent warping & support heavy loads. Heavy gauge 1" diameter steel leg construction with safety lock is built for commercial use. High impact plastic leg glides keep floors scratch-free. Easy to fold into 2-3/4" thick for storage and to carry. 30"H. Assembled.